Open your site app and click the Deploy tab (from the top menu). If your site was initially deployed properly, you should see your Github user name on the deployment page, showing you are “connected” to your Github. If you are connected to your GitHub, scroll to the bottom where the “Manual deploy” area is. Click the “deploy now” button next to it. It may take a few minutes for the site to redeploy. When it is finished, return to your site and refresh to see if the site has updated to the new version. 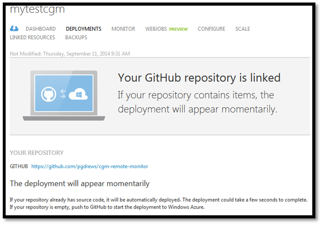 Click the arrow to the right edge of the deployment shown at the top of the deployments page. If your site still does not show the updated version, you may need to move on to the steps below. 4. Click on Dashboard if you aren’t already on that page. 5. 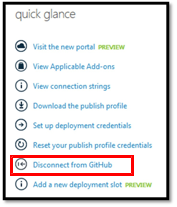 Locate the ‘Quick Glance’ menu on the right side of the dashboard, and click on ‘Disconnect from GitHub’. 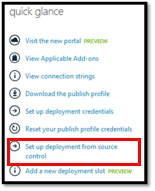 If you see ‘Set up deployment from source control’ then proceed to Step #8. 6. Click ‘Yes’ to agree to the disconnect. 7. It will show ‘Operation is currently running’ and wait for that to complete. 9. 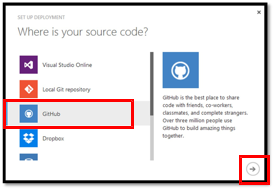 On the ‘Where is your source code?’ prompt, select GitHub and click on the arrow on bottom right. 10. Since you were just logged into GitHub, the connection / authorization connection should occur without any GitHub credential prompt, but if you are prompted, provide the necessary credentials (username & password) to connect. 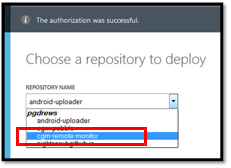 In the ‘Choose a repository to deploy’, select the ‘cgm-remote-monitor’ from the REPOSITORY NAME drop down. 11. 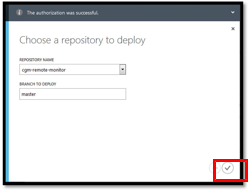 After selecting, the BRANCH TO DEPLOY should be ‘master’ and then click on the arrow to proceed. 12. Your GitHub repository will now be linked, and the deployment will begin. 16. Verify that your connection strings still exist, and that they are correct. They shouldn’t have changed, but if they are not present, you will need to reenter them. 17. Proceed to your website and test that it appears.